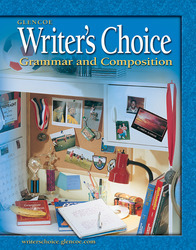 Writer's Choice: Grammar and Composition © 2005, an integrated language arts program, keeps pace with the current trends in the teaching of writing and related communication skills. Features in both the student and teacher editions build on a solid foundation of instruction including easy-to-understand explanations, clear-cut definitions, real-world examples, and skill-based assessment. The visuals and graphics throughout the textbook engage students' attention and illustrate key concepts and processes. Writer's Choice © 2005 provides students and teachers with the tools for developing skills in writing, reading, researching, speaking, listening, critical thinking, and viewing and representing. Part 1: Composition contains integrated writing and grammar lessons that provide flexibility for you and your students. Part 2: Grammar, Usage, and Mechanics includes hundreds of exercises with strategic ways to improve retention and build skills. Part 3: Resources and Skills offers short, easy-to-find and easy-to-use freestanding lessons for vocabulary, spelling, test-taking skills, electronic resources, and much more. Provide your students with the basic tools for constructing strong sentences, paragraphs, compositions, and research papers with the Writing and Research Handbook. Ease planning time with the Teacher Wraparound Edition, a resource designed for a diversity of teachers and learners.